High Stim Pre Workout! Insane Energy & Laser Sharp Focus! Contains The Most Powerful Ingredients And Their Analogs In Highly Efficacious Doses! High Stim Pre Workout! Insane Energy & Laser Sharp Focus! Contains The Most Powerful Ingredients And Their Analogs In Highly Efficacious Doses!High Stim Pre Workout! Insane Energy & Laser Sharp Focus! Contains The Most Powerful Ingredients And Their Analogs In Highly Efficacious Doses! Tired of your pre-workout not giving you enough boost?Tired of your pre-workout not giving you enough boost? Q: What is the best way to take StimMax? Q: What is the best way to take StimMax?Q: What is the best way to take StimMax? StimMax is the most powerful preworkout available, so you may want to start with a half serving to assess your tolerance. Afterwards, take one serving in the morning or 30 minutes before training for increased energy and focus. Q: What is N,N-Dimethylphenethylamine Citrate and is it dangerous? Q: What is N,N-Dimethylphenethylamine Citrate and is it dangerous?Q: What is N,N-Dimethylphenethylamine Citrate and is it dangerous? N,N-Dimethylphenethylamine Citrate is an amine that is similar to DMAA. While still effective, N,N-Dimethylphenethylamine is much safer than DMAA due to its composition. It is recognized as safe by the FDA. Q: What supplements pair well with StimMax? Q: What supplements pair well with StimMax?Q: What supplements pair well with StimMax? 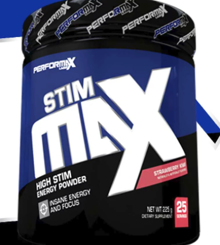 For the total package in preworkout power, StimMax can be stacked with VasoMax for enormous boosts in energy and pump. StimMax is going to allow you to push your physical limits. A strong intra-workout like IntraMax will keep your muscles fed and anabolic throughout your workout. Q: 425mg of caffeine sounds like a lot? Q: 425mg of caffeine sounds like a lot?Q: 425mg of caffeine sounds like a lot? It sure does, but it’s actually within normal efficacious ranges for fit people. 3 – 6 mg of caffeine per kg of bodyweight is the recommended ergogenic dose, so anyone 71 kg (156 lbs) or heavier is right there at the top of the range. Some studies even suggest going up to 10 mg per kg.